Clinical medicine stands at the threshold of a diagnostic revolution. At the current pace, advances in next-generation sequencing and molecular diagnostics could render the use of invasive techniques for prognostic analysis obsolete within a decade. Development of novel methods for capturing circulating tumor cells (CTCs) and tumor DNA (ctDNA), smartly dubbed liquid biopsies, have allowed researchers to detect a vast array of cancers, often before the physical manifestation of symptoms, as well as provide clinicians with the ability to track the progression of tumors throughout therapeutic treatment—all through the use of a minimally invasive methods. In this webinar, we will explore how liquid biopsies are shaping the diagnostic landscape and how these changes will impact physician decision making, as well as affect patient care. Our panelists will describe their cutting-edge research for capturing and enriching CTCs and ctDNA. Moreover, they will reveal their latest discoveries for identifying and validating the appropriate biomarkers to distinguish cancerous from noncancerous tissue. 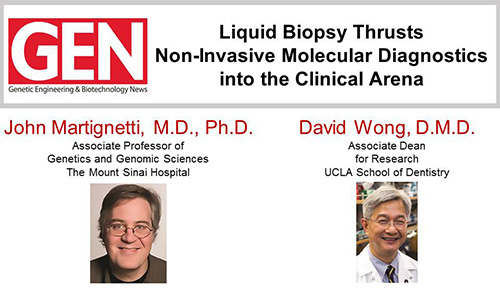 Finally, our experts will give us a glimpse into recent developments that could significantly impact the liquid biopsy field and provide answers to questions submitted by our audience. • How a completely noninvasive biofluid like saliva can utilized for systemic disease detection. • The outcomes of Phase III studies that utilize the capture of CTCs for the detection, tracking, and prognosis of metastatic melanoma. TO VIEW THIS WEBINAR ON DEMAND CLICK HERE.